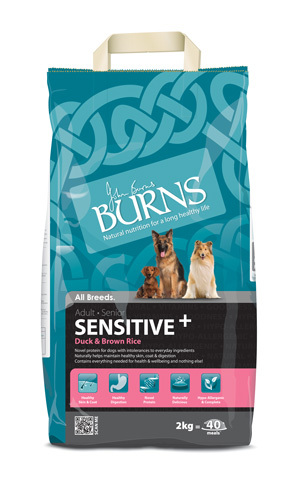 Developed by Veterinary Surgeon John Burns, What you get with Burns Pet Nutrition is a low fat, low protein food which is naturally preserved and suits most pets, although it is fairly well known that low feeding rates means that some dogs struggle to keep weight on with Burns. The only way you can tell is by using it and adjusting feeding amounts to suit your own dog! 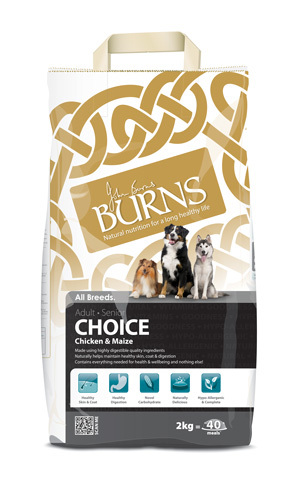 Burns produce a large range of foods, selling some in 15kg and others in 12kg bags, which can make price comparisons difficult. Some are rice based and others use cheaper maize for dogs which have developed an intolerance to rice. However price-wise per kilo they work out about the same price. There's also a Pork and Potato variety but this still includes cereal. There's a good range of natural foods to suit all ages, although no grain-free selection as yet in the range offered - some are based on rice as the cereal and others maize. All foods are natural preserved. Price-wise, Burns is very expensive (at around £51-55 for a 15kg bag) compared with similar foods in the 'natural' sector which can cost almost half the price! There is also a pouch range of moist foods, again with natural ingredients but expensive at around £1.70 each.